Great wall graphics are ones that stand out visually and reflect the values of your business! Interior graphics are a great way to enhance the look of your business while also improving your brand. Wall graphics can be used strictly for decoration or can be used as a creative tool to advertise and promote your business. 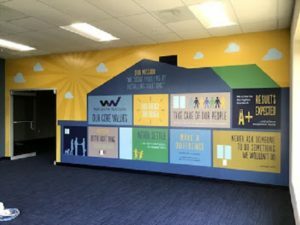 Here are the steps to designing great wall graphics for your business! Before you even begin designing your wall graphics, you want to identify and share with your graphic designer what your goals are. Maybe, you just want to create an aesthetically pleasing work environment or maybe you want to announce a specific sale or upcoming event. No matter what your goals are, make them clear before designing your wall graphics. Once you’ve figured out your goals for your graphics, the next step is to create design concepts and ideas. This is where you map out your vision for how you want the graphic itself to look. This is a good time to show your graphic designer any photos you want to use, color schemes, logos, etc. It is important for the graphic designer to visit the site before creating a graphic for you because they need to take exact measurements. It’s also a good way for them to visualize the space, decide on the best materials, and help you design a wall graphic that compliments the space. It should only be after you’ve discussed your goals, created a concept, and had your graphic designer visit the site that you should begin actually creating your wall graphics. The planning steps are the most important in ensuring that you get the best graphics for your money. Now, the graphics can be created, printed, and laminated. The very last step to designing great wall graphics is actually getting them installed. Smaller wall graphics may not require professional installation, but it is best to invest in a professional. This ensures that your wall graphics will be properly installed and last for years to come. Brand It Wrap It has all of the expertise and skills to design and install beautiful wall graphics for your business. Contact Brand It Wrap It Today for Your Wall Graphics! This entry was posted on Friday, November 16th, 2018 at 4:48 pm. Both comments and pings are currently closed.